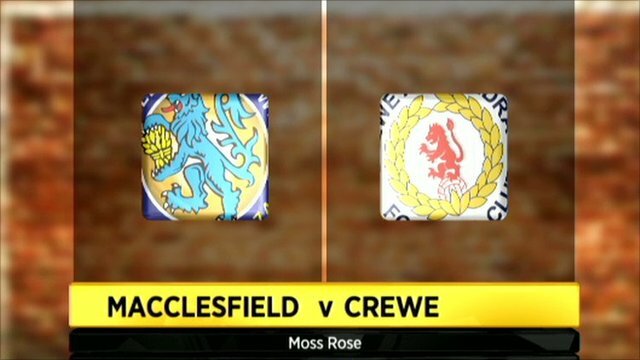 Crewe beat Macclesfield in a six-goal thriller to reach the area quarter-finals of the Johnstone's Paint Trophy. A messy first half saw three own goals with the first from Macc winger Colin Daniel before two close-range mistakes from Crewe's Patrick Ada. Lee Bell converted a penalty to make it 2-2 at the break, after Nat Brown had brought down Alex winger Byron Moore. David Artell headed in Moore's pass and Joel Grant hammered home in the second half to send Crewe through. 90:00+3:24 The game is over, as the referee blows his whistle. 90:00+3:11 Calvin Zola challenges Paul Morgan unfairly and gives away a free kick. Paul Morgan takes the free kick. 90:00+1:19 Lewis Chalmers has an effort at goal from outside the penalty area which goes wide right of the goal. 90:00+0:09 Clayton Donaldson is caught offside. Free kick taken by Jose Veiga. 89:36 Substitution Calvin Zola is brought on as a substitute for Joel Grant. 87:03 Effort from 35 yards by Colin Daniel went wide right of the target. 86:35 Clayton Donaldson takes a shot. Save made by Jose Veiga. 85:18 Jason Beardsley concedes a free kick for a foul on Byron Moore. Luke Murphy restarts play with the free kick. 83:06 Short corner taken by Ashley Westwood from the right by-line. 81:00 Shot from just outside the area by Tyrone Barnett misses to the left of the target. 80:07 Corner taken by Matthew Hamshaw. 79:35 Substitution Mat Mitchel-King replaces Lee Bell. 79:07 Substitution Hamza Bencherif leaves the field to be replaced by Richard Butcher. 77:53 Matthew Hamshaw produces a right-footed shot from just outside the box that misses to the right of the net. 76:22 Free kick awarded for an unfair challenge on David Artell by Nathaniel Brown. Indirect free kick taken by Rhys Taylor. 75:43 Free kick awarded for a foul by Lee Bell on Lewis Chalmers. Lewis Chalmers takes the indirect free kick. 74:39 Clayton Donaldson is flagged offside by the assistant referee. Indirect free kick taken by Lewis Chalmers. 73:14 Corner from the left by-line taken by Matthew Hamshaw, Matt Tootle makes a clearance. 72:03 Substitution Sam Wedgbury on for Paul Bolland. 70:01 Handball decision goes against Luke Murphy. Jose Veiga takes the indirect free kick. 70:01 Substitution Vinny Mukendi goes off and Tyrone Barnett comes on. 69:22 Outswinging corner taken right-footed by Ashley Westwood, Hamza Bencherif makes a clearance. 69:08 Paul Bolland gives away a free kick for an unfair challenge on Lee Bell. Lee Bell restarts play with the free kick. 68:23 Ashley Westwood produces a left-footed shot from deep inside the penalty area which goes wide of the left-hand post. 65:14 The referee blows for offside. Nathaniel Brown takes the free kick. 64:02 Clayton Donaldson produces a right-footed shot from the edge of the area and misses to the left of the goal. 61:33 Free kick awarded for a foul by Paul Bolland on Ashley Westwood. Rhys Taylor takes the free kick. 60:22 The assistant referee flags for offside against Hamza Bencherif. Rhys Taylor restarts play with the free kick. 58:20 The assist for the goal came from Lee Bell. 58:20 GOAL - Joel Grant:Macclesfield 2 - 4 Crewe Goal scored by Joel Grant from inside the penalty box to the top right corner of the goal. Macclesfield 2-4 Crewe. 57:11 Free kick awarded for a foul by Vinny Mukendi on David Artell. David Artell takes the indirect free kick. 56:46 The assistant referee flags for offside against Joel Grant. Free kick taken by Jose Veiga. 55:37 Clayton Donaldson produces a right-footed shot from deep inside the penalty box which goes wide of the left-hand upright. 52:55 Unfair challenge on Lewis Chalmers by David Artell results in a free kick. Lewis Chalmers takes the free kick. 52:18 Effort from the edge of the box by Clayton Donaldson goes wide of the left-hand post. 50:10 Effort from outside the penalty box by Ashley Westwood goes wide right of the goal. 49:20 Ashley Westwood takes a shot. Save made by Jose Veiga. Inswinging corner taken right-footed by Ashley Westwood from the left by-line, Hamza Bencherif makes a clearance. 47:01 Assist on the goal came from Byron Moore. 47:01 GOAL - David Artell:Macclesfield 2 - 3 Crewe David Artell finds the net with a headed goal from inside the six-yard box. Macclesfield 2-3 Crewe. 46:30 Corner taken right-footed by Ashley Westwood from the right by-line, clearance made by Jason Beardsley. 46:18 Free kick awarded for an unfair challenge on Joel Grant by Hamza Bencherif. Lee Bell restarts play with the free kick. 45:00+2:42 The match has reached half-time. 45:00+1:53 Luke Murphy has an effort at goal from just outside the box which goes wide of the left-hand post. 45:00+1:24 Paul Bolland takes a shot. Save by Rhys Taylor. 45:00+0:21 Matthew Hamshaw takes the inswinging corner, Emile Sinclair takes a shot. Lee Bell gets a block in. 44:40 Free kick awarded for an unfair challenge on Clayton Donaldson by Nathaniel Brown. Matt Tootle takes the free kick. 43:47 Matthew Hamshaw fouled by Clayton Donaldson, the ref awards a free kick. Jose Veiga takes the free kick. 42:06 Effort from outside the penalty box by Lee Bell goes wide left of the target. Correction - 41:44 Shot from just outside the box by Matt Tootle goes over the bar. 41:44 Effort from just outside the box by Matt Tootle goes over the bar. 41:26 Lee Bell takes a shot. Blocked by Jason Beardsley. 39:44 Free kick awarded for an unfair challenge on Patrick Ada by Emile Sinclair. Indirect free kick taken by Rhys Taylor. 38:56 Nathaniel Brown fouled by Clayton Donaldson, the ref awards a free kick. Lewis Chalmers takes the free kick. 37:57 Corner taken right-footed by Matthew Hamshaw, Header by Nathaniel Brown from deep inside the penalty area misses to the left of the target. 37:09 Vinny Mukendi produces a right-footed shot from deep inside the area and strikes the post. 34:32 Byron Moore has shot on goal from just outside the area which goes wide of the right-hand upright. 33:33 Free kick awarded for an unfair challenge on Jason Beardsley by Byron Moore. Lewis Chalmers takes the indirect free kick. 33:01 Matthew Hamshaw concedes a free kick for a foul on Byron Moore. Rhys Taylor takes the free kick. 31:47 Hamza Bencherif challenges Luke Murphy unfairly and gives away a free kick. Lee Bell takes the free kick. 29:22 GOAL - Patrick Ada:Macclesfield 2 - 2 Crewe Own goal by Patrick Ada. Macclesfield 2-2 Crewe. 28:06 Byron Moore fouled by Nathaniel Brown, the ref awards a Penalty. 28:06 GOAL - Lee Bell:Macclesfield 1 - 2 Crewe Penalty scored by Lee Bell. Macclesfield 1-2 Crewe. 25:30 Inswinging corner taken by Ashley Westwood from the left by-line, Jose Veiga makes a save. 23:59 Free kick awarded for a foul by Hamza Bencherif on Luke Murphy. Indirect free kick taken by Rhys Taylor. 23:19 Vinny Mukendi fouled by David Artell, the ref awards a free kick. Matthew Hamshaw takes the free kick. 22:12 Unfair challenge on Lee Bell by Vinny Mukendi results in a free kick. Rhys Taylor takes the free kick. 21:51 Centre by Jason Beardsley, David Artell makes a clearance. 19:55 Nathaniel Brown takes a shot. Save by Rhys Taylor. 19:32 Matt Tootle takes a shot. 16:24 Foul by Paul Bolland on Luke Murphy, free kick awarded. Lee Bell takes the free kick. 14:59 Outswinging corner taken by Matthew Hamshaw, Matt Tootle manages to make a clearance. 12:14 Assist on the goal came from Matthew Hamshaw. 12:14 GOAL - Patrick Ada:Macclesfield 1 - 1 Crewe Patrick Ada heads into his own net. Macclesfield 1-1 Crewe. 11:36 Foul by Byron Moore on Lewis Chalmers, free kick awarded. Lewis Chalmers takes the free kick. 9:18 Byron Moore takes a shot. Save by Jose Veiga. Ashley Westwood takes the inswinging corner, Vinny Mukendi makes a clearance. 6:51 Clayton Donaldson produces a right-footed shot from the edge of the box and misses to the right of the goal. 4:50 Free kick awarded for an unfair challenge on Clayton Donaldson by Paul Morgan. Direct free kick taken by Lee Bell. 3:48 Assist by Danny Blanchett. 3:48 GOAL - Colin Daniel:Macclesfield 0 - 1 Crewe Colin Daniel scores an own goal from 6 yards. Macclesfield 0-1 Crewe. 2:54 Luke Murphy takes a shot. Save by Jose Veiga. 0:54 Vinny Mukendi challenges Lee Bell unfairly and gives away a free kick. Lee Bell takes the indirect free kick.